If you’re an enterprise communications and collaboration specialist, especially if you work in the U.S., it’s totally understandable if you haven’t heard of or paid attention to Rich Communication Services, or RCS. But you might want to starting familiarizing yourself with this technology. RCS, developed in a GSMA-led wireless industry initiative, is a multichannel augmentation/replacement for SMS. It’s integrated natively to the mobile phone, just like the phone dialer and SMS viewer, to provide rich text and video services. The GSMA has positioned RCS as one of the next big things in wireless, touting it as an alternative to over-the-top messaging solutions like Instagram, Snapchat, WhatsApp, and WeChat. However, GSMA’s promotional efforts around RCS have had little impact so far, especially in the U.S. The reality is that RCS has seen limited market uptake. Apple has yet to announce RCS support, and domestic mobile network operators (MNOs) have been slow to adopt without support from the number one smartphone brand in the U.S. RCS has met with some success elsewhere globally, but overall rollouts haven’t exploded as the wireless industry and the MNOs had hoped. At the event, Mavenir made clear its belief that RCS wouldn’t replace any hugely popular consumer messaging services. This is understandable. Consumer messaging is generally driven by group and small-group behavior. Members of groups tend to adopt a messaging platform together and may change as a group if that platform loses its allure (witness the youth movement from Facebook to Snapchat after parents got on the social network). However, Mavenir, like others involved in wireless, said it believes that RCS can provide an excellent platform for many customer-to-business interactions — specifically, those that are application to person, or, as they’re commonly known, A2P. Mavenir refers to its implementation of A2P as RCS Business Messaging, or RBM. Messaging, whether it be via Twitter, Snapchat, Facebook Messenger, WeChat, or whatever, is increasingly being used for rich customer interactions that include text, pictures, video, and so on. In China, an exploding market has emerged using WeChat as a messaging commerce platform. However, these platforms have been chosen based on group affiliations, so lack the universality of SMS. 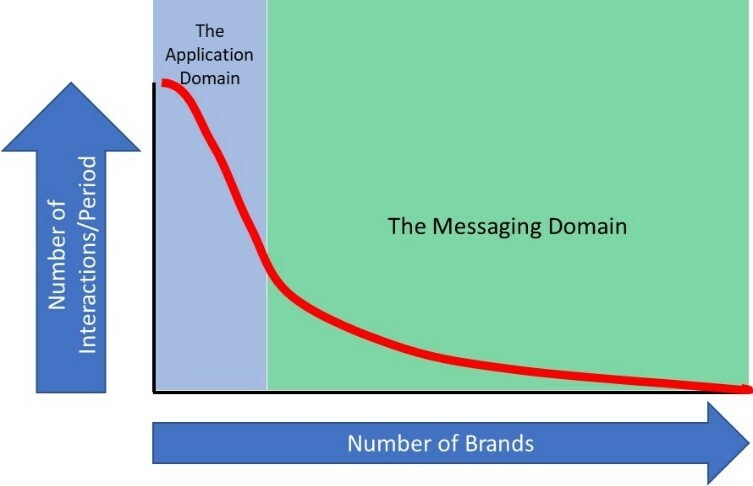 This means organizations — or “brands” in this context — using messaging to interact with their customers have to support an ever-growing number of messaging channels, all of which only access a fractional subset of the desired customer base. As new and ever more group-specific messaging platforms roll out, this landscape gets increasingly complex. Alternatively, a company might offer a brand-specific device application for download; however, consumers really have to be committed to the brand relationship to bother with a download. As a result, many customer relationships aren’t adequately supported in the emerging over-the-top (OTT) messaging environment or by applications. This is the factor that has driven the explosion in communications platform as a service (CPaaS) and SMS messaging business process integration. The universality of SMS makes it ideal for general interactions with a large customer base (dentist appointment notifications or password resets, for example). The intent is to provide the same levels of universality as SMS and device integration but with a rich set of customer interaction services to create a transformational consumer experience. The concept of using RCS, which is already on your phone, as a rich brand interaction engine has real promise. Customers can initiate the interactions using RCS from an application or directly from the RCS client included on the mobile device. The RCS client would contain a list of contacts, including brands the customer regularly interacts with, as well as offer the ability to search for new brands. This is fundamentally different from SMS, which doesn’t really provide a way for consumers to initiate an interaction with a brand. With Mavenir’s RBM, the consumer can easily initiate an interaction with a brand with which it hasn’t previously had any interactions. In demos, Mavenir even showed the ability to include paid advertising in the contacts list for an interaction. A major issue in SMS and voice is the amount of spoofing and lack of trust. In RBM, the RCS client includes a “verified” icon that lets the consumer know the brand (or entity) running the RBM interaction can be trusted. Mavenir verifies a brand’s trustworthiness during the onboarding process. With RBM, Mavenir said the goal is to have an AI (artificial intelligence)-based bot manage most if not all initial interactions. Because RCS includes a rich media experience, that interaction can include a full range of media to enhance the interaction. For example, a restaurant can send pictures to a customer who wants to order a pizza but isn’t sure what kind. Being able to see the different kinds of pizza should help the customer make a quick choice. In listening to the concepts and the Mavenir implementation strategy, I’ve come to believe that this technology may address a major shortcoming of the mobile application experience. In the figure below, the relationship between a consumer and a brand is defined based on two factors. As shown on the horizontal axis, the first is the depth of the relationship defined by trust level and frequency of interactions. Brands with which a consumer either has a high trust relationship or regular/frequent interactions are to the right, while brands that are infrequent or basic are to the left. A bank relationship would be on the right, while ordering a pizza while traveling would be to the left. The second dimension is the complexity of the interaction and the range of choices presented. Ordering a pizza can be a simple task, while transferring funds between multiple bank accounts is much more complex, leading to application use. Given the overwhelming number of apps available, consumers will generally only commit to download applications for relationships that have a combination of high trust/frequency and/or complexity. These are the relationships that fall at the upper right in the chart. 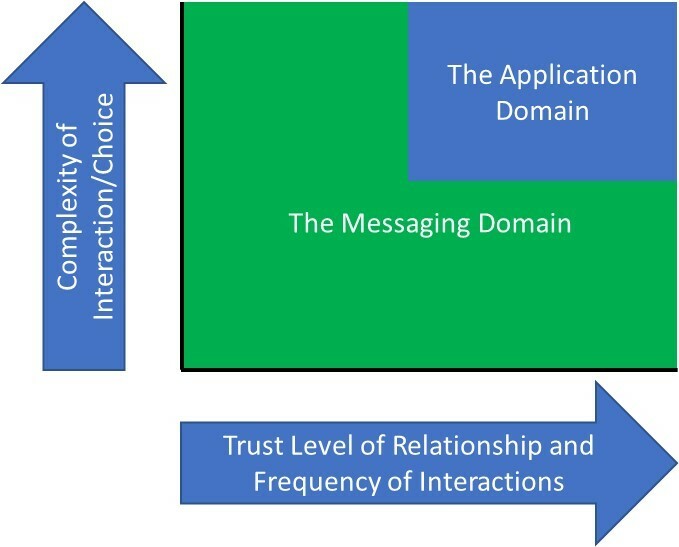 For the others, if the combination of trust, frequency, and complexity of the relationship doesn’t meet the consumer barrier to download the applications, interactions must take place in the message domain or using the mobile browser. This is where Mavenir is focusing its business messaging service. As shown in the figure below, the number of brands with frequent (and trusted) interactions is small, but the number of interactions is large. This follows the traditional asymptotic adoption curve. The majority of brands fall to the right, with infrequent interactions and often lower trust requirements. Application downloads would likely be concentrated in the brands to the left. A key observation is the volume of interactions that can be best served using a messaging concept like RBM instead of a bespoke application may be 25% to 50% of all interactions. Further, deploying a bot in a bot framework as an interaction is significantly less expensive than developing a comprehensive native mobile app or an optimized mobile browser app. An application would require support for a range of platforms and continual upgrades, whereas a bot framework with RCS takes a simple interaction definition with minimal change or upgrade required. The number of brands with frequent (and trusted) interactions is small, but the number of interactions is large. Using RBM to access the potential volume of interactions pushes the doors wide open for MNOs looking to tap into the $54 billion mobile applications advertising market analyst firm IHS Markit projects for 2020. Mavenir shared results of a GSMA analysis of the RCS rollout in Japan. Potential advertising and other opportunities RCS makes available to MNOs are six times greater than the basic A2P value, the analysis showed. Mavenir currently has 18 partners in its RBM ecosystem and is conducting RBM trials in four countries (not the U.S. at this point). The Mavenir concept is to create a consortium where the brand relationship is singular but can extend across many MNOs. Mavenir is strategically partnering with Syniverse, a leader in connecting brands to digital advertising and customer interactions. Mavenir brings the integration technology and relationships with the mobile carriers, and Syniverse provides the relationships with the brands and their marketing campaigns. The strategy is to work with the four major U.S. MNOs (AT&T, Sprint, T-Mobile, and Verizon) for almost universal mobile reach, and the four major AI platforms (Amazon, Google, IBM, and Microsoft) to enable a wide range of choice in AI/bots. Mavenir indicated it expects live RCS deployments in 2019, including the business integrations. While Mavenir clearly was building a case for and explaining the positioning of its RBM solution, it did allude to alternatives suggested by device manufacturers such as Google and Samsung. For example, Google has offered to host, for free, all the back-end transactions for an RCS-based customer interaction service platform in the U.S. The MNOs would just deliver the RCS traffic to Google and Google would do the rest, maintaining the relationships with the brands, building out the AI, etc. Mavenir’s position, which it suggested MNOs seem to be coming around to, is that this relationship essentially gives all the consumer data, advertising value, and control (that 6x revenue) to Google, potentially reducing the mobile operators to mere bandwidth providers, for messaging bandwidth that is generally included in the monthly subscription in the U.S.
Mavenir said it believes in an industry consortium in which it provides the interoperability and bot integration, Syniverse facilitates the brand relationships to the MNOs, and the MNOs are the primary operational and management entities. To accelerate MNO adoption, Mavenir is proposing the option of an initial revenue-sharing deployment model, with the option for the MNOs to transition to licensed-based deployments when volume and business models warrant. Another argument made for being distinct from Google is the use of gathered data for competitive advertising (all the ads you get in a category when you search for anything). In the RBM model, the relationships are absolute with the brands, though this is more of a business model than purely technical, so Google could respond. I came away from the discussions believing that RCS is a potentially new customer interaction channel worth exploring. It has rich services, universal mobile availability (there are rumors Apple is preparing an RCS launch in 2019), tight device integration and functions, and no barrier of application download/adoption. The API integration to leading AI platforms assures that the interactions will be as natural and rich as possible. Mavenir’s RBM is a natural on-ramp into the contact center as the interaction moves from the bot domain into the human interaction arena. In the Vodafone trials of RCS compared to SMS, brands see up to 7x increases in click-thru rates, a factor that will warm the heart of every CMO. And at a Mavenir-sponsored RCS for business engagement session held earlier this year at Mobile World Congress, the Subway CMO indicated the company sees a 10x increase in click-thru when a picture is added to A2P messaging. One area that may have major challenges is how existing CPaaS companies get access to the RCS services to deliver their value. Today, CPaaS companies like Twilio and Vonage Nexmo and carriers like Bandwidth and Tata offer CPaaS services based on the relatively open access to SIP trunking and SMS messaging. As RCS is an integrated service to the mobile IMS infrastructure, only MNOs with an IMS infrastructure can implement the solutions. CPaaS providers will have to develop relationships either with the MNOs or with a structure like the Mavenir RBM to access this new capability. Both the technical and business relationships for how third-party CPaaS companies will get access to RCS based rich customer services will have to be defined and codified. The value add of CPaaS providers over the underlying RCS services in this environment will need to be defined further. Regardless of whether the MNOs and Mavenir/Syniverse are successful in creating the RBM platform or if Google, Samsung, or some other company succeeds, RCS should attract consumers with the simplicity and ease of use for arranging of casual and occasional brand interactions. This will result in an acceleration of use and an acceleration of brands wanting to be represented in this new environment. For enterprises, understanding this new customer channel and how to deploy and engage through it may be critical for customer satisfaction going forward. CPaaS and SMS integration took the industry by surprise; RCS-based messaging for business shouldn’t do the same. Phil Edholm is the President and Founder of PKE Consulting, which consults to end users and vendors in the communications and networking markets to deliver the value of the integration of information and interaction. Phil has over 30 years’ experience in creating innovation and transformation in networking and communications. Prior to founding PKE , he was Vice President of Technology Strategy and Innovation for Avaya. In this role, he was responsible for defining vision and strategic technology and the integration of the Nortel product portfolio into Avaya. He was responsible for portfolio architecture, standards activities, and User Experience. Prior to Avaya, he was CTO/CSO for the Nortel Enterprise business for 9 years. At Nortel, he led the development of VoIP solutions and multimedia communications as well as IP transport technology. His background includes extensive LAN and data communications experience, including 13 years with Silicon Valley start-ups. Phil is recognized as an industry leader and visionary. In 2007, he was recognized by Frost and Sullivan with a Lifetime Achievement Award for Growth, Innovation and Leadership in Telecommunications. Phil is a widely sought speaker and has been in the VoiceCon/Enterprise Connect Great Debate three times. He has been recognized by the IEEE as the originator of “Edholm’s Law of Bandwidth” as published in July 2004 IEEE Spectrum magazine and as one of the “Top 100 Voices of IP Communications” by Internet Telephony magazine. Phil was a member of the IEEE 802.3 standards committee, developed the first multi-protocol network interfaces, and was a founder of the Frame Relay Forum. Phil has 13 patents and holds a BSME/EE from Kettering University.